This image shows the aftermath of the Antares rocket explosion, which took place on Oct. 28, 2014. The photo was taken from the air on Oct. 29. Orbital Sciences Corp. has assembled an investigation team to examine exactly what went wrong when the private spaceflight company's Antares rocket exploded shortly after liftoff on Oct. 28. Officials with NASA, the Federal Aviation Administration and Orbital Sciences have been working toward understanding what caused the massive failure of the rocket, but they have not found the root cause of the accident yet. 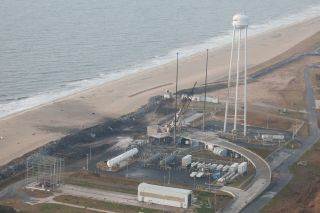 The rocket mishap took place on a launch pad at NASA's Wallops Flight Facility on Wallops Island, Virginia. The Antares was carrying an unmanned Cygnus spacecraft loaded down with supplies for the International Space Station at the time of the explosion. Orbital Sciences holds a contract with NASA to fly these robotic resupply missions to the orbiting outpost. The Federal Aviation Administration's oversight team for the investigation includes Michael Kelly, Chief Engineer for the FAA Office of Commercial Space Transportation and Marcus Ward, Mishap Response Coordinator for the same office.